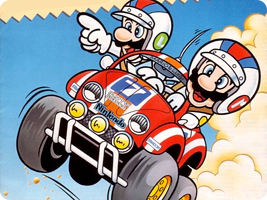 A racing game series for the Famicom Disk System, featuring Mario and Luigi. The first game was a top-down racer, while the second was a rally game. Both games included competition prizes in Japan when they were released. You would have to win a particular race and then submit your best time to Nintendo.